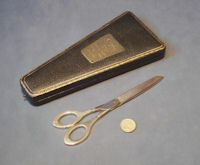 Pair of original, quality, silver handled scissors used for an opening ceremony in Kingston-Upon- Hull in 1935, in the original shaped and fitted box. 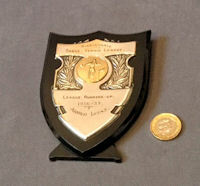 The case has a hinged lid, cream silk lining to the lid, black velvet to the base, gold tooled leather cloth to the outer and a gilded commemoration plaque to the top of the hinged lid. The plaque is engraved "Presented to Ald. A. Stark, J.P. and Lord Mayor of Kingston-Upon-Hull on the occasion of the opening by him of Hull's Super Service Station for Automobile Purchases (Hull) Ltd, 10th July 1935". 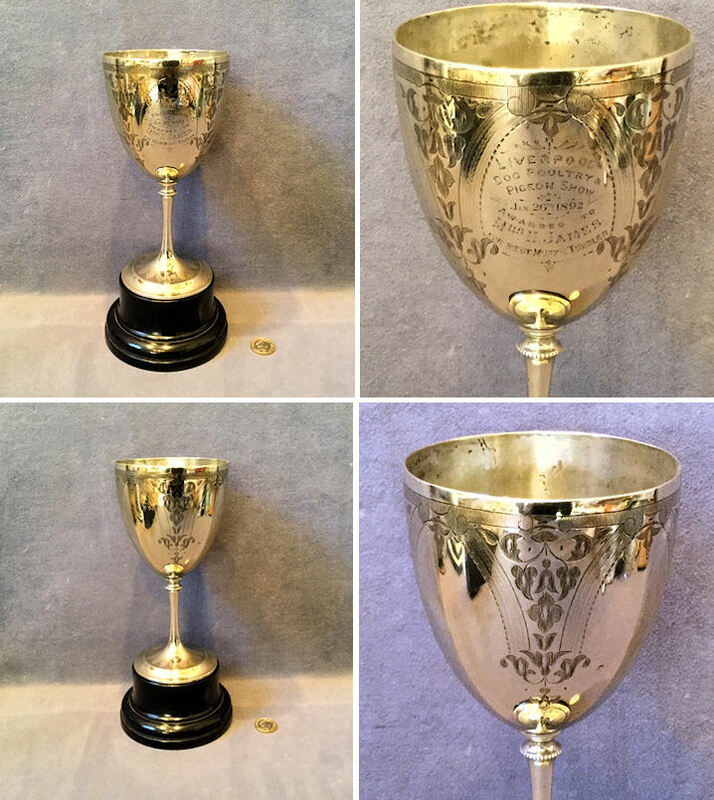 The silver handled scissors are hallmarked for "Birmingham 1934" and engraved with the initials "A" and "S". All is in super condition, the scissors having little use only and the box is in near mint as you can get. What a most unusual opening ceremony. Box 9.25" x 4.25" and 0.75" front to back, scissors 7.5" x 2.25". 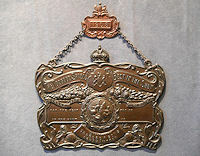 Original, quality, pressed copper "Toogood Best in The Show" shield in the original unpolished patinated finish, with the year presentation shield above at the top of the chains dated 1908 and bearing the Royal Coat of Arms. The main shield of a thick guage copper is deeply embossed with fine detail, the Kings Crown to the top above the Royal Coat of Arms, a central cameo of various Poultry surrounded by a larrel wreath, with an array of flowers and fruit above to the left and vegetables to the right. The text is all in banner swags "The Toogood Shield For The Best in The Show", "Toogood and Sons, The Kings Seedsmen", "For The Best in The Show, Won By... and at... " and "Presented By Toogood and Sons Southampton". This shield has never been engraved and is in mint condition in all aspects, with just a little discolouration to the reverse. 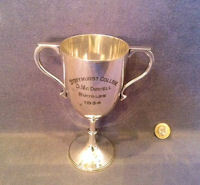 The first we have seen of this size awarded by "Toogood and Sons". 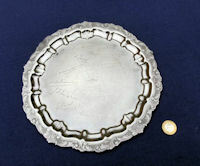 Main shield 12.25" x 10", total length complete 13.75". 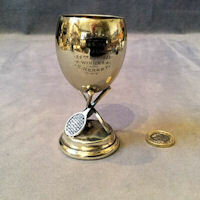 Original, quality nickel plated trophy cup with embossed decoration, side handles and mounted on an ebonised turned wooden plinth. 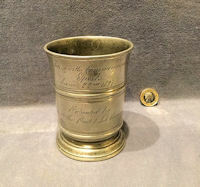 But most of all engraved to the front "Presented to Pte A Metcalfe K.O.R.N.L on his return from active service in the war of 1914 - 18, from the people of Mallerstang". Complete and in good order. 7" tall x 6.25" widest, front to back 3.5" and base 4" diam. 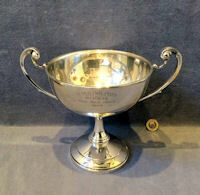 Original, quality nickel plated dance trophy engraved with flowers and swags and "1st Prize Fox Trot Competition, Hammersmith Town Hall March 9th 1923". 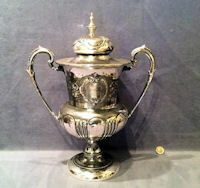 This unusual example nickel plated on Brittania metal is rather rubbed in places but otherwise all is complete and in good order. 8" tall x 4.5" diam and foot 3.5". 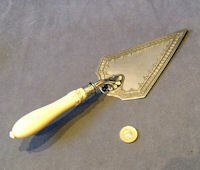 Original, quality late 19th century silver plated presentation trowel with engraved decoration to the upper surface and a carved ivory handle. 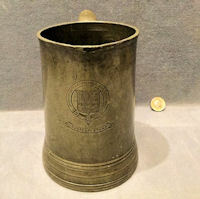 The reverse has plate marks for the maker and the number '1026', but neither side has been engraved with an inscription. A very short fine crack to the ivory handle of no consequence, otherwise all is complete and in good order. A super example waiting to be presented. 12.25" x 4" x 2" front to back. Click on photo for larger and for larger view. 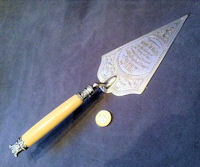 Original, quality late 19th century silver plated presentation trowel with engraved detail and an irovy handle. 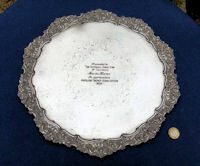 The upper surface is engraved "Presented by the Trustees of the West Bridgeford Wesleyan Chapel to Miss Nellie Alcock on the occasion of her laying the memorial stone April 19th 1888". Some rubbing to the plated surface to both sides and some minor dents, otherwise complete and in good order. 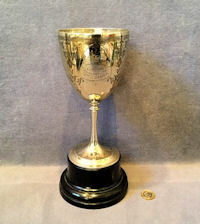 All has been polished and lacquered, although the lacquer may be removed at no extra cost. A super piece of Social History. 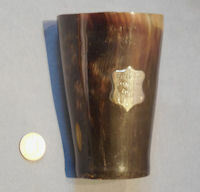 Total 11.5" x 3.25" x 1". 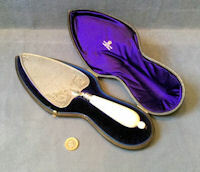 Original, quality late19th century hallmarked and engraved silver presentation trowel in the original morrocan leather covered fitted case. 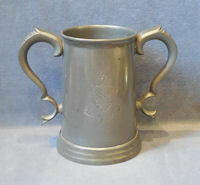 This superb example has a clean and smooth turned irovy handle and a shaped silver blade engraved unusually to both sides. 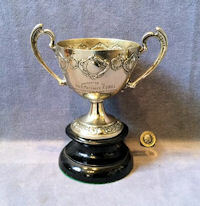 The top is engraved with acanthus scrolls and "Presented to James Davies Esq. on the occasion of his laying a Memorial Stone of the Welsh Wesleyan Chapel, City Road London, 7th Dec 1882". 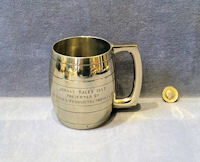 The reverse is engraved "Presented to Mr Ian Rowberry managing director Rosehaugh Copartnership Developments Ltd by directors of Wates Construction (London) Ltd to Commemorate the topping out of the New Caledonian Wharf SE16 on Wednesday 2nd November 1988". 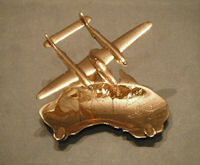 Good clear silver hallmarks are also to the reverse. The fitted case is lined with Royal Blue velvet and silk and the hinged lid interior is detailed in gilt "Goldsmith's Alliance Ltd Cornhill London". 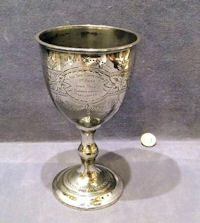 This whole item is faultless and the best we have seen. 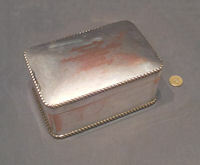 Box 14" x 5.25" x 2.5". Trowel 12.5" x 4" x 2". 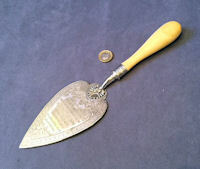 Original, quality silver plated presentation trowel with engraved detail and an ivorine handle.The reverse is stamped "Maton Cardiff" for the manufacturer and the face "Presented to Miss M. Watts on the occasion of the laying of the Foundation Stone, Noddfa Baptist Chapel Fochriw Sept 29. 1903". The ivorine grip has two decorative ferules. 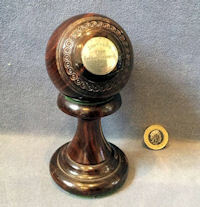 All has been polished and lacquered, although the lacquer may be removed at no extra cost. Complete and in good order. 13" x 3.75" x 1.5".